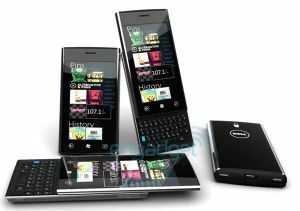 Microsoft WP7 phones starts shipping, including the Samsung Focus and Dell Venue Pro, both of which use AMOLED displays. The Venue Pro is a portrait slider with a 4.1" AMOLED display, and is now available in some Microsoft stores (and will be available on-line from Dell's site next week). The Focus Focus has a 4" Super-AMOLED and is now shipping for AT&T's network.